Programmable Logic Controller which plays a very important role in automation of every industry. Manufacturing process require a sequence of operations in order to make a product. And in this case sequencing can be done by manually or some type of controller. In late 1960’s sequencing operations are performed by using a bank of relays wired to perform a particular job. But there were drawbacks, logic systems where difficult to reprogram for production changes and also troubleshooting is very difficult. To avoid the above drawbacks PLC’s are used. PLC’s use the sum relay logic function and sequence is not hard wired but can be programmed and stored in a memory. The contents of the memory are easily changed. PLC’s are used first by automobile industries. A programmable logic controller handles binary inputs and binary outputs related to logic statements. The inputs are derived from input elements such as limit switches, push buttons etc., based on the set values of temperature, pressure and the like. The output of PLC is also binary status that activates the output devices like solenoids, valves, servomotors, etc. the controllers checks the status of each input and performs logic functions in the central processing unit as per the program stored in the memory and generates the required binary output. Scanning of inputs is done cyclically at a fast rate. The cpu fetches instruction from the memory and executes them in a sequential manner. An internal clock controls the sequential fetching of the instructions. The heart of PLC’s is a computer but not all computers become programmable controllers. To become the heart of a PLC a computer must be designed to operate in the industrial environment, which can be many times unfriendly to conventional computers. A PLC should use a computer that can operate over wide temperature range (0 to 60’C ) and a wide humidity range (0 to 90 percent ). It must be packaged in rugged enclosure and be well shielded against electromagnetic interference, duct, dirt and moisture. Its memory circuits must be backed up with battery power. It must be capable of being programed with logic commands, symbols or mnemonics that corresponds to relay ladder diagrams. Finally, it must be designed for scanning operations. A scanning computer solves logic from the beginning of memory to some specified stopping input. Once the end is reached, the operation repeats again. A typical programmable logic controller offers many of the features listed below. Multi-digit alpha-numeric display is used for timer values, counter values, process parameters, fault messages etc. Programmed using ladder diagrams or personal computer based software. Compared to conventional ordinary relay controls, a programmable logic controller enjoys the following benefits or advantages. 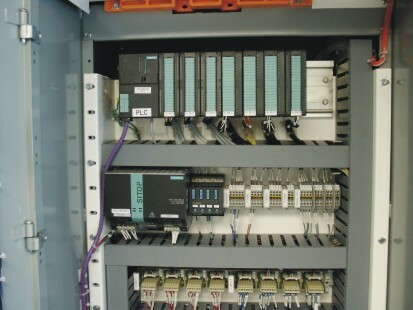 The wiring of a PLC system usually reduces by 80 percent compared to conventional relay control system. So, cabinet size is small leading to less floor space requirement. The power consumption is greatly reduced as PLC consumes much less power. Self-diagnostic functions enable easy and fast trouble shooting of the system. A single panel can be used in multiple applications by merely changing the program. Spare parts for relays and timers are greatly reduced. PLC speed of operation is in millisecond range, hence machine cycle time is improved tremendously. Thus productivity is increased. Costs much less particularly where there are many I/O devices and the control-functions are complex. A print out of the PLC program can be obtained in a short time. Therefore hardcopy documentation can be easily maintained.